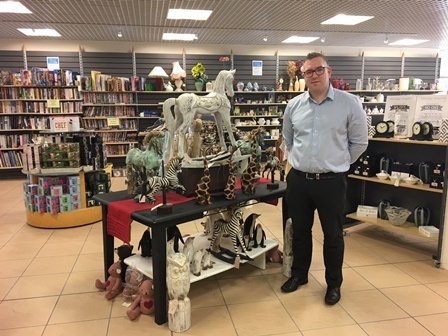 Robert Evans, 33 from Codsall, works as an Area Retail Manager for the Beacon Centre based in Wolverhampton and is studying for a Chartered Manager Degree Apprenticeship in the University of Wolverhampton Business School. Robert, who had previously worked for the Co-op for sixteen years, now runs seven Beacon Centre shops, including a café and a warehouse, across the Black Country. The Chartered Manager Degree Apprenticeship, BA (Hons) Business Management, is designed for professional managers who take lead responsibility for people, projects, operations and/or services to deliver long term organisational success. The three year part-time course covers all aspects of business, including management, marketing, human resources, finance and operations management. Delivery is by a mixture of face-to-face, distance learning and in-house company mentoring and training support. Learning focuses both on theories and the application of all aspects of management. Robert said: “I started to study for a Higher National Diploma in Building Studies when I was 18. My family members were working in the building trade and after my A Levels I wasn’t really sure what I wanted to do. “I didn’t finish the qualification but started to work full-time in retail and was really enjoying the job. I worked my way up to become a Supervisor and Store Manager and my aim was to progress to Area Manager. The Beacon Centre is a non-levy company which contributes 10% towards the cost of study with 90% of the degree funded by the government. The University offers Higher and Degree Apprenticeships in Chartered Management (CMDA), Higher Apprenticeship in Construction Management with pathways for Civil Engineering & Built Environment, Chartered Surveying, Chartered Legal Executive and Healthcare Science Practitioner Degree Apprenticeships.